When Joseph Rykwert and I sat down to discuss "hermits' huts" in India for Res almost a decade ago to accompany the publication of Ananda Coomaraswamy's important manuscript on "Early Indian Architecture: Huts and Related Temple Types," Joseph made a point that evidence from ancient India would have been quite useful to him in writing his book On Adam's House in Paradise: "It would have been invaluable, because there was no material on the pre-Gupta architecture of India then available to me." Basing his work on India's long tradition of ritual literature, however, the great French scholar of Vedic India, Louis Renou (1896-1966), had already published his article on "La maison védique" in the Journal Asiatique in 1939. The Sadas hut is Prajâpati's belly. The Udumbara wood is strength (life-sap). When the Udumbara pillar is erected in the middle of the Sadas hut, one thereby places food, life-sap, in the middle. It is perhaps Renou's caution about such interpretative agendas that makes his scholarship refreshing for architectural history today. He is quite sensitive to the places his evidence has been stored in the Indic tradition and to the various uses to which his texts were put over time, but his objective is to reconstruct the pragmatic practice of architecture in Vedic India, for which he must put his ritual texts through a non-universalizing sieve. Much like Coomaraswamy, however, Renou's scholarship is encrusted by his citations, written for a small group of Vedic scholars. In working with my student, Carrie LaPorte, on a useable translation of Renou's article, I have attempted to bring to the surface the practical information that is at the core of Renou's narrative, but to retain the dense citation - with its abbreviations - in notes for those who wish the references. Renou looks first for "practical aspects of houses in the Vedic period" in a layer of texts on ritual (Gr.yasûtras) that in passing deal with "the rites that accompany house construction" (§ 1). From these he learns about materials - bamboo, thatch, straw mats, rope - ; orientation and organization; and process - post holes, binding, etc. He then tests his understanding of constructional terms and procedures by looking at a further set of texts that deal with the staging of sacrifice and ritual (Shrautasûtras), where sheds and huts used in ritual performance are described. "In spite of their special role, these shelters provide valuable information concerning the process of building" (§ 9). Some of these sheds shelter priests, the sacrificial platform, or chariots. He finds in the descriptions given in these texts additional practical terminology for roof systems, cross-beams, etc., and in the directions and timing of ritual some confirmation of the processes of construction. in one passage of a funerary hymn ... the poet supplicates the Earth to allow a thousand pillars to be raised in the cavity where the dead repose, so that her weight will not crush those who take refuge in her breast. Yet for him the goal is clear: "gradually the conditions for bringing together these prescriptive texts become evident.... This is again an advance ... in determining a technical terminology" (§ 24). Letting one type of literature illuminate the next, Renou manages to establish an historian's sense of valid evidence, proper process, and actual practice. He manages, for example, to interpret one controversial hymn that describes the "untying" of the house, not in terms of "magical symbolism" but as part of the process of attaching mat walls to the house frame described in a different class of texts (§ 23). sufficient consideration to the humbler dwellings of the poorer folks in the villages or the still humbler shelters of hermits and mendicants.... [One misses] any consideration of the aboriginal and indigenous prototype. This is not a naive continuity, however. These huts have also been validated by imitation over centuries in eastern India, their form used as a conspicuous sign for local identity and continuity both in mosque architecture of the Sultanate period and the brick temples built by Hindu landlords in the sixteenth and seventeenth centuries (Fig. 10). The system of counting roofs or roof lines Renou finds in the Shrautasûtras (§ 17), for example, parallels one modern form of classification still used for these later buildings. Ethnography and ethnohistory must become self critical, of course, but Renou's careful architectural graphing of texts can point the way. Figure 1. Reed hut from a relief carving from Mathurâ, U.P., ca. second century A.D. (after Percy Brown). Figure 2. Leaf-thatched dome-and-cornice hut from a relief carving from Gandhâra, Pakistan (after Percy Brown). Figures 4-9. Etchings showing Hindu castes and thatched huts with bamboo posts, mat walls and awnings, Bengal, made by Balthazar Solvyns in the 1790s. Figure 11. Balthazar Solvyns, etching showing ritual hut among other forms of urban and temple architecture, Bengal, 1799. § 1. It is in the ritual literature, not the oral chants (Mantra), that we may hope to find information concerning the practical aspects of houses in the Vedic period. All of the Gr.hyasûtras, for example, describe rites that accompany house construction. By means of these descriptions, this ritual literature provides rare glimpses into the process of building and even into the organization of the house interior. Terms used to denote a house vary in these texts. The most common is gr.ha ; agâra also is used, but the more specific term is shâlâ. For example, the Kaushikasûtra uses shâlâ when discussing a ritual act that is effective at a certain distance from the house or is to be used upon entering a new house. 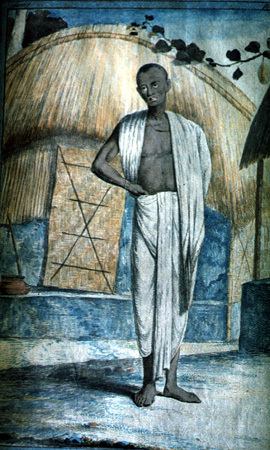 The Shatapata Brâhman.a uses shâlâ to designate "profane" habitations as distinct from cultic constructions. Terms of a more general nature are also used, a typical habit of ritualists to avoid a precise terminology. Thus we find veshman, "habitation"; sharan.a, meaning literally "refuge"; avasâna, literally "place where one removes the harness after a journey" but also meaning "site of the house." The word that occurs most frequently in this series, however, is vâstu, designating both the house and its site. One text uses the word vimita ("construction") to refer to a ritual "hut" of the same type described in the Shrautasûtras (§ 11). § 2. The rituals (vidhi or karman) relating to a house are generally called vâstushamana (literally "appeasement of the soil"). In the Vaikhânasîyas, the ritual of building is integrated into the practices concerning birthing; elsewhere it stands alone. We here restrict ourselves to facts that reveal techniques of construction, leaving aside instructions given in several texts pertaining to the nature of the soil, choosing of the date to begin construction, etc. The ground is to be cleaned with an udûha, a type of broom. Care is taken to lay out the surrounding wall (parilikhya). The shvalâyan.a Shrautasûtra, always more detailed, directs that a thousand furrows should be made. It seems that a preliminary sketch should be created by digging and tilling the soil (uddhatya). The shvalâyana orders that the site should be of such a nature as to allow water flowing from all directions toward the center to form an ambulatory path (pradaks.in.a) around the bedroom (shayanîya); then the waters should drain without noise toward the east. According to Nârâyan.a's commentary, this means that the soil should be raised at the sides, depressed in the center, and slightly slanted to the east; and that there should be a channel (syandanikâ) to the north so that the water could drain off. The Baudâyana Shrautasûtra states only that the location of the bed (talpadesha) should be situated to the northeast. The shvalâyana assigns the kitchen ((bhaktasharan.a) to theplace where the water drains (samavasrâva), i.e., on the east side of the house, north of the bedroom. But the same expression, under the variant samavasrava, is used to note that the general siting of the house is to be chosen such that the draining of water should be the same everywhere; similarly, Devapâla explains that "no side should be lower or higher than any other." From a shared earlier practice no doubt these two divergent traditions arose. § 3. The salon (sabhâ) in which Narâyan.a specifies the master of the house greets and receives his guests, is to be "built" in the part of the house "that inclines toward the south" according to the shvalâyana (i.e. in the northern part according to Nârâyan.a's commentary). Finally, the same text implies that the best situation for this room is at the water's confluence, that is to say at the center of the depression as Nârâyan.a mandates. The shape of the site is either that of a brick (shâdâ) or of a "circle" (man.d.aladvîpa), according to some texts. The shvalâyana uses less imagistic terms: the space is either square (samacaturasra) or rectangular (âyatacaturasra). § 4. Construction of the house itself begins first by digging a certain number of holes (garta). These post-holes are to have a depth equal to the distance from the ankle to knee so that the water drains well from them (dhârayis.n.ûdakatara). Jayarâma, in his commentary on the Pâraskara Gr.hyasûtra, speaks of four corner holes. The Kaushikasûtra mentions a middle post-hole (madhyama garta). The next step in the process is the installation of posts (sthûn.â) of udumbara wood. Sometimes wood of an inferior quality is used, but the Shân.khâyana Shrautasûtra recommends a ritual of atonement (prâyashcitta) to avoid potential problems. Nirukta calls the pillar (sthûn.â) "that which rests in the cavity (darashayâ)." Some commentaries indicate that if the house is "white" (dhavalagr.ha, which may mean "of stone" in this context), stones replace the sthûn.â, and one commentary adds that for houses a stone is placed at the bottom of each hole to support the post placed on top of it; however, no text of the Vedic period itself mentions stone as a building material. Because the number of holes is not specified, we do not know the precise number of posts. The Pâraskara Gr.hyasûtra speaks of four, but this may only refer to those at the corners. In reality a rather larger number of pillars may have been used; nine are mentioned in the Shân.khâyana Shrautasûtra (see § 5). § 5. A central pillar (madhyamâ sthûn.â) is frequently named. (The compound form, madhyama-sthûn.â, confirms that we are dealing with a technical term. ) The Shân.khâyana uses the more poetic phrase "king-post" (sthûn.ârâja). Other texts speak of two such sthûn.ârâja, which Mâtr.datta's commentary understands to be the "two long sthûn.â to the north and south." The erection of a "king-post" (that is, a central pillar capable of supporting the entire structure according to Nârâyan.a's commentary) takes place last. More precisely, the pastamba Gr.hyasûtra instructs that the pillar to the south side of the door be first erected, then that to the north. These posts that support the door on the north and south and their post-holes are referred to as "of the portal" (dvâryâ). § 6. From this it seems that the door of the house, or at least the principal door, was on the east façade, but, again, texts differ. According to the Gobhila Gr.hyasûtra, the door can be to the east, north, or south; a door to the west is expressly excluded. According to the Mânava Shrautasûtra, it is to the east or south; Laugaks.i concurs. the Vaikhânasîya mentions two doors located to the east or north and enumerates east, west, south, and north doors. One text mentions a "door fastener" (dvârapidhâna); others mention paired dvârapaks.as, which undoubtedly denote either leaves or panels that comprise a door or the doors themselves. Two texts say that there is an appended or rear door (anudvâra) "placed so that one cannot be seen" (yathâ na sam.lokî syât). One commentary says that this might mean either a door overlooking the court or one opposite the main door, and that this rule is intended to prevent the master of the house from being seen by untouchables (can.d.âlas, etc.). The Vaikânasîya gives the name bhuvan.ga ("earth edge"), by which it seems to mean the threshold (dvârapat.t.ikâ). § 7. Returning to the foundation posts, bamboo sleepers (vam.sha) are laid so as to connect posts to one another and to help support the roof, but no details are furnished regarding the number and arrangement of these transverse beams, apart from the central one (madhyama vam.sha). One begins by placing the east beam, then the northern one. Because these two beams are "attached" to the pillars, they bear the name "sañjanî" in one source, and the two "paks.as" of a secular hall (= the door posts of § 6?) are connected to the central beam with the aid of a cord according to another source. We learn that ritual dwellings are characterized by the west to east direction of their sleepers (vam.shas) while secular halls (shâlâs) have these oriented south to north. The wood used for these beams (vam.shas) is subject to splintering according to one text. Only one text in the Gr.hya tradition makes reference to the disposition of rooms: the shvalâyana advises that rooms (sharan.a) should be arranged (kârayet) in the spaces between the beams (vam.shas; vam.shântara), which means, according to Nârâyan.a, that divisions by means of partitions (kud.ya), etc., are customarily fitted in between two vam.shas. This word kud.ya, however, is attested in only one Vedic source, where it refers to an exterior wall. It is also a wall or a wall's junction with a post (sthûn.â), seeing the Pâraskara Gr.hyasûtra's use of the word "sam.dhi" (juncture), but in conformity with the Yajus (sacrificial prayers), which do not view this as a technical meaning. § 8. We are told, incidentally, that the house is covered (channa) and that it includes roofs or awnings (chadis). We know that the roof was thatched, but specifics are given only in the Shrauta. The word stûpa (literally, it seems, a "tuft of hair" in the form of an egret bun) is found in one Mantra. As point of fact, the sacrificial yûpa post was assimilated into the symbolic stûpa, but it seems rather that the word stûpa originally designated the points of thatch that the Shrauta texts describe as being gathered back toward the post at the center of the roof (§ 17). Elsewhere it is the prastara ("bouquet of grasses placed on the vedi") that is compared with the stûpa. A point treated with great detail is that of a "water reservoir" (man.ika) installed on four stones . The particulars given are not concerned with construction, however: the question is of a portable utensil. Allusions are also made to seats (âsana) and to niches (upasthâna) in which images of the gods are placed. A "ritual foyer" (agninidhâna) is also mentioned. We must recall that the act of constructing a house and particularly of raising the pillars is designated by the root mi- , which in the Mantras is generally a predicate. But the proper term to denote the erection of sthûn.â is uc-chri. §9. Some of these indications become clearer if one compares them with those given in the Shrautasûtras. These later texts describe on several occasions - normally in the discussion of the Agnis.t.oma ceremony - a variety of small structures intended to accomodate those people who oversee or assist in the sacrifices or in ritual functions. The commentaries sometimes incorporate them under the classification "yajñâgâra." These are slight temporary constructions, not used for habitation. In spite of their special role, these shelters provide valuable information concerning the process of building: that is to say they form a commentary on the description of the dwelling in the Gr.hyasûtras, and the shared vocabulary is considerable. At the beginning of the Agnis.t.oma ceremony, a hall (shâlâ) used to shelter those assisting in the sacrifices is described. One text calls this hall vimita, but vimita is distinct from shâlâ in that, as Sâyan.a specifies, the former is square and the latter rectangular. According to Baudâyana's Shulbasûtra, a shâlâ forms a rectangle that is 16 or 12 feet in length, 12 or 10 feet wide. §10. If we take Baudâyana's description as a base, we see that this shâlâ consists of a system of vam.sha sleepers oriented west to east, from which the name prâcînavam.sha for this edifice is derived. More precisely, according to Sâyan.a, two traverse beams are positioned on the corner pillars and serve as lintels for the east and west doors; other beams are placed above (uparivam.sha), perpendicular to the first two. The middle beam (pr.s.t.havam.sha or madhyavala ) has its ends positioned at the center of the two lintels. The Shrauta texts do not mention the uprights (sthûn.â), but the Shatapatha Brâhman.a does speak of the "king-post of the east side." The two series of texts complement one another. The shâlâ is slightly raised to the east, lowered to the west, and enclosed on all sides (parishrita). On the nature of this enclosure (bhittyâdinâ), similar descriptions provide us more information. Openings (atikâsha) at the four cardinal points form doors. The Gr.hyasûtras of pstamba and Hiranyakesin, however, dissociate these openings from the doors, placing them at corners (srakti) facing intermediary regions. There need not necessarily be four doors, according to the pastamba Gr.hyasûtra; however, the hall that has four doors promises the greatest boon to those making the sacrifice. Some texts mention two doors, which are specified as dvishaya, the meaning of which can be clarified if one compares a description that says the opening of a tent for chariots is such that one can see three rooms at the same time. This prescription contrasts with the non-visibility required by the Gr.hya (§ 6). § 11. Baudâyana again mentions a shelter (agâra) when discussing the cooking of ritual food (milk); a hut for the wife of the sacrificer (patnishâla) ; and possibly two other shelters (parivr.te) serving as some sort of bathing huts enclosed with mats. Libation huts referred to in the Kaushikasûtra have east and west doors. Finally, a structure used in the ritual of the dead (vimita or agâra) has a north and a south door. Elsewhere, two small semi-detached sheds situated just outside of the sacrificial area are mentioned: the âgnîdhrîya or âgnîdhra, which is the residence of the priest officiating over the fire (âgnî), and the mârjâlîya where purifications are made. Both are square, each five cubits per side. The first shed has a door to the south, the second a door to the north. The âgnîdhrîya has its traverse beams oriented west-east and has four pillars; is bound on all sides with woven mats (parishrita); and its entrance is to the south. The south side of the mârjâlîya is to be left open for circulation (sam.cara) according to one source; another instead places circulation to the north in the âgnîdhrîya. (This is a slight divergence that does not necessarily indicate an authentic dual tradition). § 12. The most explicit instructions regarding the "house" for ritual are those which are given to us for the construction of a chariot shed (havirdhânaman.d.apa) and a "seat" [or shed for the sacrificial assembly] (sadas). These two descriptions are closely related and are meant to be complimentary. The chariot "pavilion" (the word man.d.apa only figures in commentaries ) is a small building designed to house two chariots for the soma; it obviously is coordinated to the dimensions of the chariots, which not expressly given elsewhere. According to the Baudâyana Shrautasûtra, six holes (garta; elsewhere also avat.a) are dug on the north-south axis in front of the two chariots, which are placed side-by-side; six holes are then dug behind along a parallel line. Into these holes are driven twelve posts (sthûn.â), the brackets of which (literally "ears"; karn.a) are oriented west-east. The Mânava Shrautasûtra discusses four sthûn.â on each side, those in front of shoulder height and those in the rear shorter. The pastamba Gr.hyasûtra speaks of pillars erected on all sides while Bhâttanârâyan.a's commentary only mentions two pillars on the front and instructs that the man.d.apa be slightly higher in the front than in the back, which agrees with the Mânava Shrautasûtra. Similarly, the pastamba Gr.hyasûtra says the man.d.apa should be slightly raisedin front, slightly lowered in back. § 13. According to Baudâyana, there are two cross-beams (vam.sha), one south-north, the other east-west. pastamba also mentions two north-oriented cross-beams, placed respectively on front and back pillars. Placement of a roof (chadis) comes next; the term designates a "covering" of thatch (kat.a) laid over the transverse beams. The central roof (madhyamam. chadis) is laid on first, then the lateral roofs to the north and south of the central roof. This middle roof is three cubits in width, nine in length. The interstices of the roofs (antavarta) are crammed with thatch matting (kat.a) and reeds (tejanî). Some texts also refer to two doors. § 14. Above the east entrance, in the space between the two middle pillars, is an ornamental fronton called the "forehead" (rarât.î). This rarât.î is a strap-work of finely knotted reeds (ais.îkî), inclined toward the east and attached to the front cross-beam by a thread. The Mânava Shrautasûtra says this rarât.î is a pad to prevent drafts (varasa) made of grasses that one places at the center of a strap-work of reeds; it seems that the grasses are gathered together by encircling them several times with thread, the two ends joined together, and the strap-work suspended from the front cross-beam. § 15. The enclosure (parishrayan.a) consists of two mats that are hung to surround the hall (man.d.apa). These are called ucchrâyî. One of these is attached to the post on the right side of the front door (dvârbâhu ) and unrolled towards the right in order to cover the south face and half of the east face up to the rear post on the right side; the other is reversed and arranged symmetrically with the first. These mats are attached to the pillars by the following process: the Adhvaryu priest takes a handful of kusha grass, grasps the front right pillar, ties the grass where a needle is driven in, and passes a cord through the eye of the needle. He makes a knot (granthi); at the hanging end of the knot he secures the smaller end of the rope, then undoes the knot. Assistants cover the post from bottom to top, securing the grass by winding the cord but without making knots, and undoubtedly attaching the matted wall covering at the same time (according to Caland). The same procedure occurs for the front left pillar and both of the rear pillars. According to some authorities, the knots are only undone when all this work is complete. All the other knots referred to should also be removed. § 16. Most of the preceeding description of the construction of a chariot shed also applies for the "seat" (sadas) placed in front of the chariot shed in the sacrificial area: specifically the roof joints (antarvarta; § 13), cladding (parishrayan.a; § 15), instructions dealing with visibility (sâm.kâshina; § 10) and the two doors. In some sources this covered platform (sadas) measures nine cubits in width, east-west, and 27 cubits in length north-south. Other sources give measures of 10 by 27 or 28; 9, 10.5, or 12 by 18, 21, or 24; some suggest that the dimensions can be left indeterminate or be well enough estimated by the officiants and servants, as is done for the mound of earth that serves as an altar (dhis.n.ya). Three rows of holes are made. A central pillar of udumbara wood (from which it derives the name audumbarî sthûn.â) is raised the height of the sacrificer. Its brackets are oriented east-west. The outer pillars (paryantîya) are of navel-height, as are all the seats (sadas) (or they are improvised). The brackets of the outer pillars are also oriented east-west. § 17. As noted earlier, the three principal cross-beams are arranged in a south-north direction; this orientation is characteristic of the sadas in contrast to the east orientation of the chariot shed (havirdhâna). But other cross-pieces are oriented east-west. The roofing system consists of nine roofs (navacchadi). The central roof, which rests on the audumbarî post, is secured first; then the two side roofs to the east and west; then three units to the south; and finally three to the north. The edges of the roofs to the north are inserted under those at the center so that the front edges of the southern roofs would be slightly above the others. The Mânava Shrautasûtra mentions 15, 17, 21, or 11 roofs; pastamba mentions 15, 16, 17, or 21 in conformance with the ceremonies. An awning (bhitti; perhaps made of woven bamboo) may substitute for the roof (chadis) when the latter is lacking. The pitch of the roof is towards the north in some sources; or towards the central post (audumbarî) in others. § 18. We have followed the systematic descriptions given by the Shrauta texts. Most refer back to the Brâhman.as or to the prose of the Sam.hitâs, but only the directions for ritual permit us to follow events in detail and in progression. Can one go still further? If there is some trace in the Mantras of allusions to the house and its organization, is this in accord with facts given in the ritual and exegetic literature? The R.kasam.hitâ has only very meager and predictable evidence. It is noteworthy, however, in that it does contain references to the principal elements of construction. In one section the term for beam (vam.sha) appears in a passage where it is said that the priests raised Agni [the fire-god] like a beam (vam.sha). Indra [the lord of heaven] is likened to the raised sky that does not need beams (avam.she). The R.g Veda also refers to pillars (sthûn.â) in comparisons such as "you carry men, O Agni, like a support pillar." One finds the roots stabh-/skabh-, with the derivatives skambha and skambhana closely connected in figurative uses, which may be the more ancient name for pillars (sthûn.â). This root crops up again in that sense in the form stambha in the prose of the Brâhman.as and in the Shrauta and Gr.hyasûtras. The root sri is used in a similar sense in one passage of a funerary hymn in which the poet supplicates the Earth to allow a thousand columns to be raised in the cavity where the dead repose, so that her weight [that of the Earth] will not crush those who take refuge in her breast. § 19. The house itself is called gr.ha, a term corresponding to the archaic words dama and durona. This last is probably composed of dur "door" and oni "arm," equivalent to "dvârbulu" in ritual texts, thus confirming the importance of the door towards which many prescriptive comments are directed. The plural (both masculine and feminine) durya, which is also a word for house, similarly encompasses an ancient sense of stambha or sthûn.â as "the pillar of the portal," a meaning also preserved in ritual (§ 5). In brief, there is only slight discrepancy of expression between the Mantras and the prose sources, not major rethinking or changes. The term for door itself (dvâr, etc.) is seen only in allegorical uses, but its frequency is significant. The term âtâ is also, it would seem, a name for a "door pillar or jamb." Harmya, a word with a very broad meaning ("house and its dependencies" or "large house; castle") is a poetic term not found often in the Mahâbhârata, from which it passed into the common language. Other words are less clear, such as veshman or okas; sadas does not seem to designate a particular type of construction. Finally, there is pastya, "residence." The word chadis is used to designate the roof of a vehicle (anas), analogous to an awning that in some of the Shrauta covers chariots (havirdhâna), which are known as chadis. As for stûpa, the word has been used to describe the high pinnacle of a tree, as a figure of celestial space, and also the plumes that form the flames of Agni. For its technical use, see § 8. Finally, the word sabhâ, translated uniformly from the Mantras as a "(place of) public gathering, assembly," can rather be either a "meeting room of a private residence" (notably where one plays) or a house itself. One passage declares that a sacrifice confers a reward consisting of sabhâ and prâja: i.e., "house" and "children." § 20. Some notable details appear also in the Atharvaveda. The word shâlâ appears to be its proper term for "house." The specification of this word does not hinder the survival elsewhere of terms such as gr.ha, vâstu, âvasatha, etc. One notes also the expression mânasysa patni, "mistress of the establishment," which permits one to infer that a shâlâ is only one part of an ensemble. The importance of the house is one of the characteristic ideas of Atharvavedic literature. 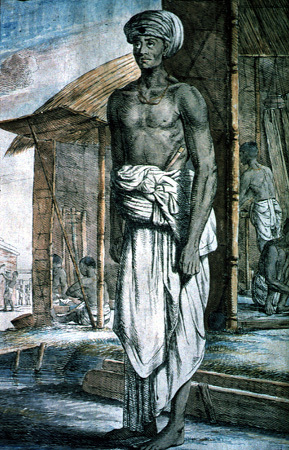 It is not by chance that most of the Mantras that accompany construction, according to the evidence of the Gr.hyasûtras, are borrowed from the Atharvaveda, most notably the chant to "climb on the column of bamboo that serves as the traverse beam," which stresses the essential building operation. The Atharvaveda maintains the productivity of verbal groups uc-chri- and ni-mi. Besides the term upamit of the R.g Veda, it uses pratimit and parimit to designate pillars (sthûn.â) that determine the site, rather than "buttresses," for which the justification is not clear. The use of sam.-car recalls the idea of ambulatory space (sam.cara) of the Shrautasûtras (§ 11). § 21. Hymn IX.3 contains several more precise details that are not in agreement with the facts gleaned from ritual texts. That the house is called tr.n.air âvr.tâ immediately recalls the thatched walls of the ritual shâlâ; and the term chadis [roof] is found with the epithet catus.paks.a, making a comparison to a quadruped, i.e. "a roof that rests on four corner posts." The mention of havirdhâna, agnishâla, and sadas tends to show that the shelter described is less a private dwelling than a ritual residence comprising all the auxiliary structures necessary for large sacrifices. In verse 21, the poet plays with numbering 2, 4, 6, 8, and 10 paks.a. This does not appear to be a question of wings of the residence, but simply pillars or, if one wants, compartments that determine the placement and number of pillars. This translation of paks.a best agrees with the attribution of catus.paks.a above and of dvârapaks.a and paks.as in § 6 & § 7. As for kosa and kulâya in verse 20, it is too much of a stretch to translate these as "plaiting and braiding, mortise and tenon" as does Henry ; kosa, at least, could be a "recess" corresponding to the niches (upasthâna) in the Pâraskara Gr.hyasûtra (§ 8). § 22. Other features are less easily identifiable. We ignore the role of sam.dam.sha ("tenons"? ; Henry) in verse 5. The "cord" (shikya) of verse 6 has many usages in ritual. None seems indispensable here. The translators prefer to see this as an ornamental device, but it is perhaps better to recognize this as the cords that secure the pillars (sthûn.â) to the beams (vam.sha). The palada [bundles of straw] that clad the house are undoubtedly identical to tr.n.a, which one has seen above, while paris.vañjalya must indicate the enclosure of mats that "embraces" the residence. The most difficult term is aks.u from verse 8: it is said that this aks.u has a thousand eyes (sahasrâks.a), resembling a "diadem" in that it is spread out (vitata) and tied (naddha) to the line of division (vis.ûvati). Geldner thinks another name for pr.s.t.havam.sha might be "master- beam." It is more likely a poetic term for the thatch that covers the hall (shâlâ) or the peak (stûpa) that surmounts the roof: variants clearly direct us towards reading this as an element of "covering." § 23. Finally, the hymn in question lays stress on a point that has given rise to a variety of modern interpretations. It is not contested that prayer is intended to accompany the erection of a house, and the Kaushiksûtra confirms that the person for whom the prayer is made receives the structure (shâlâ) by right of a ritual fee. But we read expressions such as these: "we release what of you, oh house, is tied (naddha); we undo your bonds (pâsha) and your knots (granthi)." Bonds (nahana) are untied, as, are, figuratively, the structural members and joints of the house, and the covering (apinaddha) made of it.a reed is unravelled. One wonders with what fuss the poet so insistently describes unbinding member by member the abode whose construction he celebrates elsewhere. Zimmer sought to identify in this some magical symbolism; others argue that the hymn describes demolition, not construction at all. Henry sees in these untied pieces some sort of "scaffolding" rendered unnecessary once the house is complete; Bloomfield stresses the information given by the Kaushikasûtra above; and finally Oldenberg guesses that it has to do with the demolition of a house and its transfer to a location where it would be rebuilt. But these inverse transactions are presented with a sort of simultaneity [in the text]: it is at the same moment when the residence is raised that its bonds are taken off one after the other. A single event fits this description: that is the final event in the making of the ritual man.d.apa (§ 15) in which one unties the knots that serve to attach the frame of the two mats to the enclosure. § 24. The Mantras other than those of the R.g Veda and Atharvaveda stress certain facts that are known from the ritual prose: gradually the conditions for bringing together these prescriptive texts become evident. The Vâjasaneyi Sam.hitâ enumerates sacrificial "shelters": havirdhâna, âgnîdhra, sadas, patnîshâla. This is again an advance in understanding from the Atharvaveda in determining a technical vocabulary. Other Mantras speak of sadas and of sadasas pati. A perhaps ironic expression is sabhâsthân.u, referring to a persistent gambler as a "pillar of the games room." The word geha appears. One Mantra deals with a residence of eight pillars and ten paks.a; one variant of this latter term apparently designates pillars of the portal. Other terms that appear in Mantras are apidhâna, dvâraphalaka, and duryâ. The verse that accompanies the hanging of the rarât.î (door's fronton) conforms with ritual processes: the peak is called syû and the word rarât.î itself is evoked by the initial expression vis.n.o rarât.am asi. Another Mantra mentions tâlpya, which is undoubtedly equivalent to the beds (talpadesha) cited in § 2. § 25. A common fact in a group of Mantras which does not contradict any prescription is that cattle are lodged in the house. 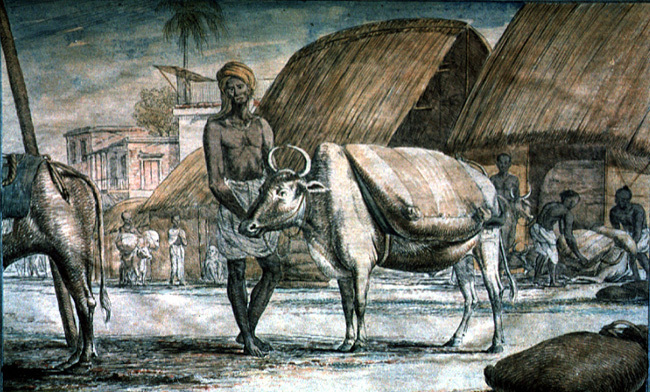 Actually, there is no decisive passage on this matter in the R.g Veda, but the Atharvaveda is more conclusive: in the course of two hymns that describe the house (shâlâ), it is said "may the calf, may the child, may the dairy cows come to you (oh, shâlâ), when they return in the evening"; also "hommage to bulls, to horses, all of which are born in the house"; and "you cover (châdayasi) in your breast, Agni, servants as well as cattle (oh shâlâ)." Other verses seem more clearly to confirm this situation than do prose citations: in one the cowshed is called gostha and in another an allusion is made to a goshâlâ. Besides several terms that extend the notion of a "living room" or "refuge" among the names of the house given in the Naighan.t.uka, we find châyâ, which is observably derived from the Vâjasaneyi Sam.hitâ where it is juxtaposed with chadis. If we rely on Vedic texts, we are in the presence of a type of house that is extremely rudimentary, composed of an armature of posts, connected at the summit by transverse beams onto which a thatched covering is attached. The walls are woven mats. Neither stone nor brick are used. Brick, however, is well known in the tradition of the Yajurveda, but its use there is limited to the "stacking" of the fire altar (agnicayana) and of accessory annexes (dhis.n.ya). A series of five rows of bricks are laid in a certain order and are separated by beds of earth. Some of these - the "naturally perforated" svayamât.r.n.n.a - seem undoubtedly some sort of porous stone. Others are called "clay bricks" (loges.t.aka). The circumference of this construction is marked by twenty-one stones called parishrit, some of which are of a large size. Nothing obliges us to consider that the shelters described above were the normal type of private residence; a significant amount of the details that assist us in their reconstruction are provided by descriptions of ritual "huts," the intended use of which is entirely different. And yet no other process of construction is mentioned in these sources. This appears particularly singular today, when we are able to measure [through recently discovered archaeological sources] the degree to which architectural technologies were known to certain prehistoric civilizations in the northwest of India.